Watt Drive, founded 1972 is an Austrian technology company with its head office in the south of Vienna. It has specialised in products and system solutions for automation- and drive technique. Since Dec. 2011 Watt Drive is a part of the company WEG, one of the leading international manufacturers of electric motors. 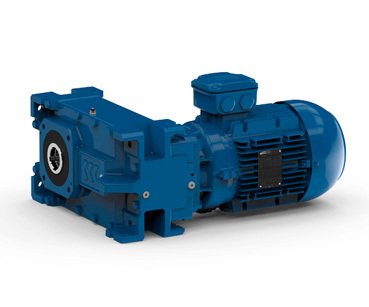 Watt Drive develops, produces and sells gear motors, three-phase motors and frequency inverters. With its motor- and gear system, it offers a modular combinable array of complete drive systems for production machines and industrial manufacturing plants. 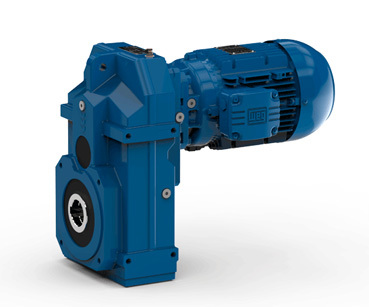 WG20 is the first geared motor range to be completely developed in-house at WEG. 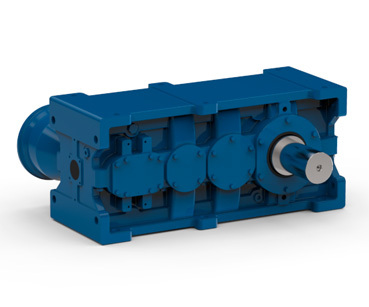 It comprises helical, parallel shaft and helical bevel gear units with torques between 50 and 600 Nm. These two-stage units excel with their large ratio range, as well as being exceptionally efficient thanks to the sophisticated design. The light, yet robust, aluminium housing of the gear units in the WG20 range provide a highly versatile and reliable product, with a wide range of possible applications. The helical gear units come in five housing sizes for nominal torques from 50 to 600 Nm and are available in both foot and flange designs. 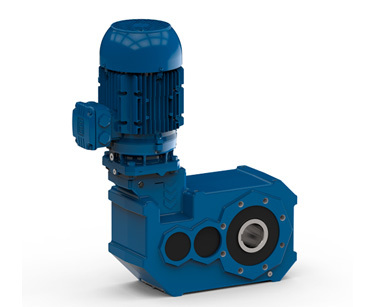 While the two smaller gear units (C00 and C01) are able to perform to their full potential with just two stages, the larger C03 to C06 are available in both two and three-stage versions, for those applications in higher torque ranges. Thanks to their structural design, parallel shaft gear units are particularly suitable for conveyor technology applications. All four sizes can be fitted with either a hollow shaft, output shaft, mounting flange or shrink disc. The ratio range of gear unit sizes F04 and F05 can be extended by a third gear stage. 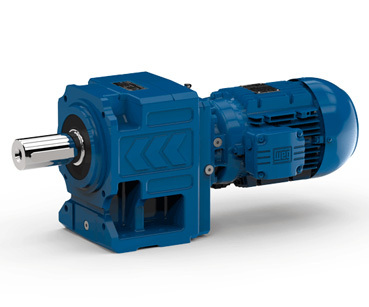 Watt Drive gearboxes and geared motors are the electro-mechanical key elements for low backlash, smoothly running and highly dynamic drive systems. 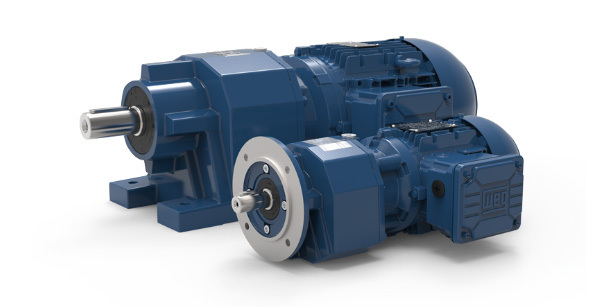 Our high-performance gear units are built to withstand the toughest industrial applications. The gear housings are machined on all sides and permit diverse mounting positions and applications, making them much sought after in the industry. 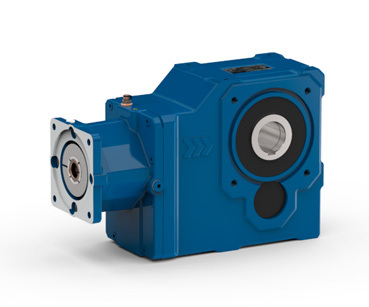 As a result our geared motors are often to be found as part of our customers own machines. The smooth running of Watt Drive gear units and the outstanding load capacity of WATT teeth are achieved with 3D design supported by FEM (Finite Element Method). This tooth geometry guarantees optimum rolling contact under load. The special tooth root design in combination with tooth helix angle, tooth depth, the materials used and surface finish maximizes load capacity. This high gearing capacity enables smaller wheels to be used for the same torque, and smaller gears with exceptional power density also increase reliability. Watt Drive geared motors are consequently incredible space savers. Gearing manufactured with such micro-geometric precision allows the gearing play required for trouble free rolling contact to be substantially reduced and therefore the gear backlash to be minimized. Double chamber shaft seals developed by Watt Drive are used as standard in parallel shaft, shaft mounted and helical worm gears for a high level of tightness. The drive for conveyor technology! 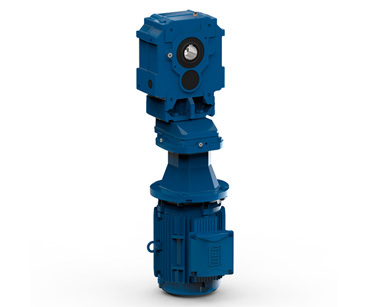 In addition to the benefits of the parallel shaft geared motor, this is an extremely economical model, especially for shaft and flange mounting. Special double chamber shaft seals developed by Watt Drive are used as standard, as in the parallel shaft geared motor. Various mounting and possible applications by Uniblock - gear case! The UNIBLOCK® gear housing machined on all sides, the particularly stable housing and minimum outside dimensions enable diverse mounting options and applications. 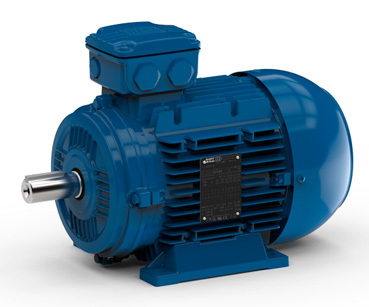 As aresult, these motors often form an integral part of our customers machine designs. High precision manufacturing and top gearing quality guarantee minimum backlash in Watt Drive gear units. Compact, eye-catching, unique for limited space issue! The compact and structure optimized gear housing of the helical bevel gears distinguish themselves by being machined on all sides and are therefore, ready for a variety of mounting options and applications. The unique motor position provides an almost flat and easy to mount on ”machine interface”. Various standard shaft executions and the double chamber shaft seals, developed by Watt Drive, are ready for use. Shaft and flange dimensions are equal to our helical worm gears. In the basic executions the gear boxes are designed as 2 stage gears up to the size K. 75 (1.250Nm). The bigger gear boxes, beginning with the K. 77 (1.500Nm) are designed as 3 stage gears. 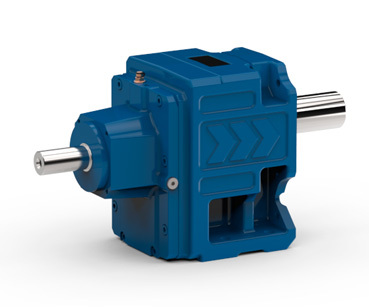 Due to the unique combination of optimized worm wheel material with special lubricants, optimized shape, this powerful motor achieves high levels of efficiency and torque. The housing machined on all sides enables diverse mounting options. Double chamber shaft seals are used as standard. The low contour design makes it suitable for implementing applications e.g. in the food industry. The housing has no recesses, which simplifies cleaning - a particularly essential feature for areas with stringent hygiene requirements. Worm geared motors for small power range. 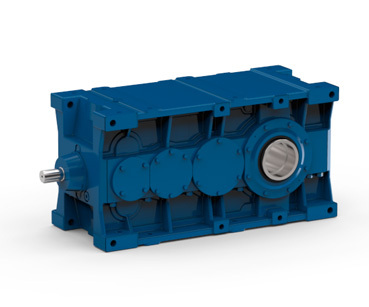 The WATT small worm gear unit adapt themselves concerning UNIBLOCK® design optimally in the MAS® geared motor program. The units have on all sides different fixing possibilities and enable an easy assembling for the customer. Other drive configurationscan be designed by use of built-on accessories (e.g. torque arm and output flanges). The housings are made in light weight construction out of aluminium die cast. Motor attachment is realised in general by means of IEC adapter B5 or B14A. 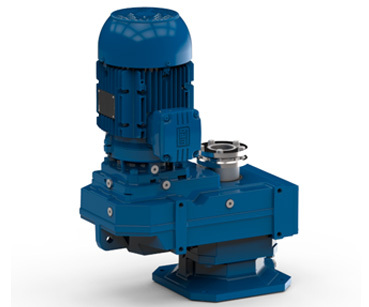 Agitator and extruder drives - reliability that meets the highest demands. 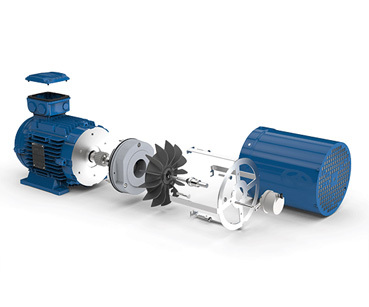 The agitaor drives are part of the modular gear system in the MAS® program. Aim of development was maximum sealing protection and a long storage product life while at the same time providing extremely reliable radial and/or axial power. The Watt system adapter enables all motors commonly found on the market to be built on the complete MAS® gear system. The drive motors are added on by using the adapter, without having to open the gears. The motors do not need to be oil-tight. Addition of NEMA - motor size 56 - 286 is possible. Addition of IEC - motor size 63 - 225 is possible. 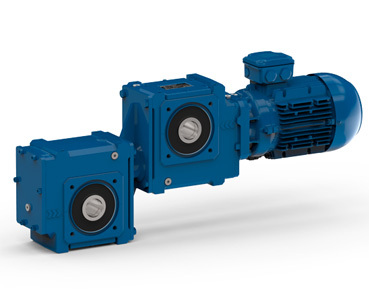 Gear systems with input unit (-WN) allow the running of WATT MAS® gear unit via the extension of drive unit elements such as coupling, belts or chains. As subsequent ratio for shafts that are already slow or running at engine speed! Manual input for regulating or adjusting movements. To synchronize mechanically, for multiple drive units by using a common input shaft. Also for gear units that are driven from output (turbine gear units for generator drive units). 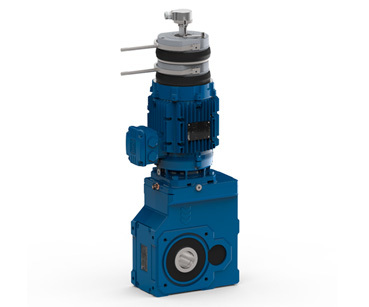 For gear units that are under considerable load, such as in the field of chopper machines, whereby liquids or couplers for excessive loads between the motor and gear unit are implemented! 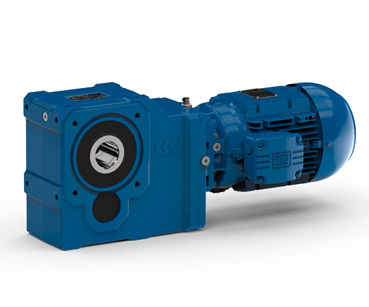 The EUSAS® integral motor is part of the WATT motor system. All features and benefits have been implemented and further developed. 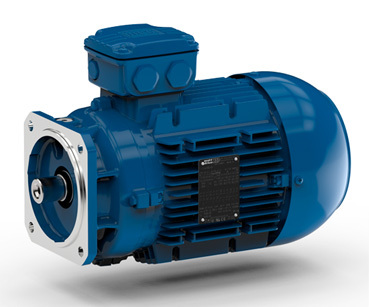 The motor is robust, in keeping with the high demands made by the industry and in the short term is capable of excessive loads. The motors are equipped with a reinforced suspension and are directly built into the gear units, resulting in a very short, compact design. The standard is equipped with a brake end plate as NDE-side (non driven end side). By using the standardized motor modules (for more information see “Motor systems”), customer-specific solutions can be implemented quickly and economically. The options in the motor system are also available in Watt norm motors. 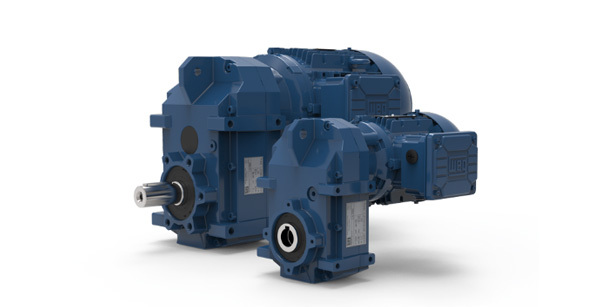 The type series F.. RX 8.. (parallel shaft gears) and K.. RX 8.. (bevel gears) are available with torques of up to 120kNM. The drives can be implemented in many branches of modern engineering, like e.g. the conveying or environmental technology. With such vigorous packages, serial products, as well as customer optimised drive solutions, can be realised quickly and market-conform. Watt Drive is planning the optimal, machinery oriented drive selection together with the customer. A successful realisation of the project targets is the most important feature of our philosophy. Innovative total solutions up to 120 kNm. The parallel shaft gear units F.. RX 8.. have a 1 - 4 stage design and therefore cover a large reduction range. The thermal power limit of the gear units are between 5.5 kW and max. 445 kW. The motor mounting is established with an IEC adapter with coupling. The housings are worked on all sides so that they can be used for every mounting position. They are standardly manufactured of grey cast iron EN-GJL-250. The gears can be implemented either as shaft mounted gears with hollow shaft as well as parallel shaft gears with output shafts. Precisely manufactured gearwheels with involute profile guarantee high efficiencies and a low-noise running. The bevel gears K.. RX 8.. are designed 2 to 4-staged by which thermal power limits from 14 - 304kW are covered. 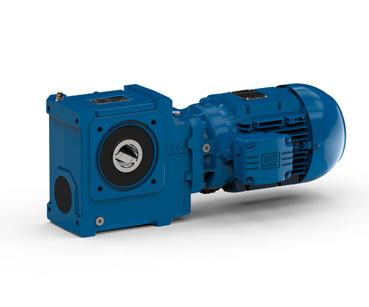 With bevel gear motors, an IEC adapter with coupling establishes the motor mounting. The input level of those drives built the bevel level so that a swivelling of the input shaft is possible. Thus more mounting positions can be established, which is of a great advantage in case of a small mounting space. The housings are worked on every side like the parallel shaft gears and have the same mounting dimensions at the same size. If you are looking for a complete drive system or single components that cannot be implemented from a standard model, then we are the right people to contact. Our product range can be customized by our application engineers to suit your requirements. The already described special drive units were developed according to customer requirements. Increased customer use while observing the highest quality standards has top priority. Our drive unit solutions are in operation in almost all four corners of the world and receive acclaim due to their high reliability and long product life. All inner parts are taken from the MAS® program. The casing was designed according to an individual customer request in ductile iron EN-GJS-400-15 (GGG 40). The direct attachment of the roller conveyor motor results in very compact design. Water-cooled helical bevel gear units as roller conveyor gears units. All inner parts are taken from the MAS® program. The casing was designed according to an individual customer request. The extension of the roller conveyor motor was realized by using a special adapter. Watt Drive drives are a mainly propelling factor in the food industry. Delivery ranges from serial drives to, like in this case, specialized drives, which are designed according to the customer’s requirements. 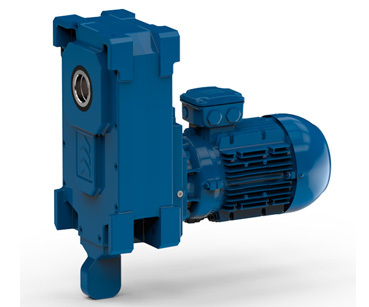 Based onto the gear modular system MAS® Watt Drive excels as a flexible, quality orientated partner of the industry. 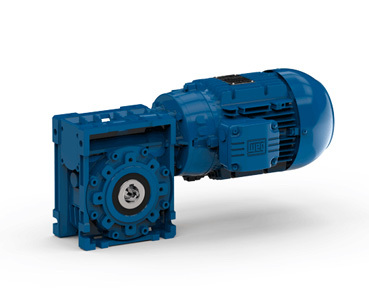 The drive unit consists of a helical worm geared motor with a built-on worm drive. The connection of both worm shafts is ensued with an elastic coupling. Watt Drive helical bevel geared motors for stage technology. WATT helical bevel geared motors are used as the gear unit, which were realised in accordance with the specific requirements of the customer. The particularly high demands in quality of stage technology (noise, operational safety, …) are the deciding factors that the extensive Watt Drive product portfolio were able to fulfil completely.